Dark-Readers: Marcus Sedgwick Cover Reveal!!! The novel is set in Anapra, one of the poorest neighbourhoods in the Mexican city of Juarez. Twenty metres outside town lies a fence - and beyond it - America – the dangerous goal of many a migrant. Faustino is one such trying to escape from the gang he's been working for. He's dipped into a pile of dollars he was supposed to be hiding and now he's on the run. He and his friend, Arturo, have only 36 hours to replace the missing money, or they're as good as dead. Watching over them is Saint Death. 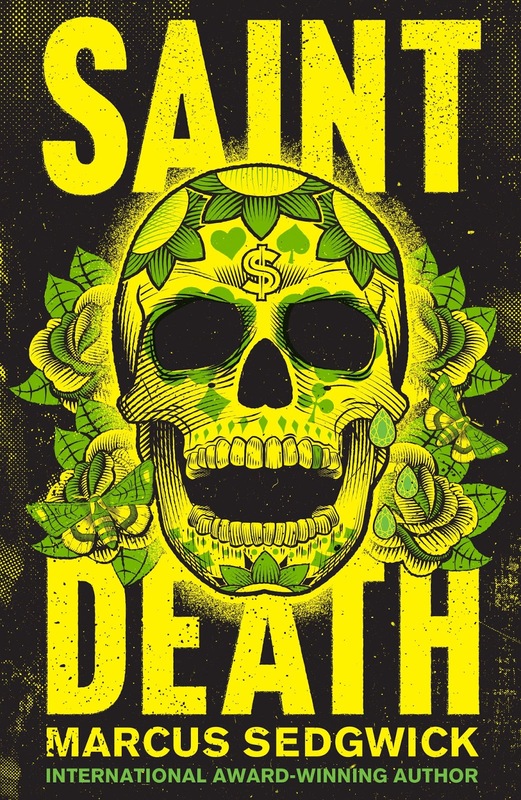 Saint Death (or Santissima Muerte) - she of pure bone and charcoal black eye, she of absolute loyalty and neutral morality, holy patron to rich and poor, to prostitute and narco-lord, criminal and police-chief. A folk saint, a rebel angel, a sinister guardian. And just incase the GIF is making your eyes go funny here it is again in all its brilliance!!! The Book is published October 6th 2016 so you'll just have to stare at the cover lovingly until then. Let us know what you think of it using the hashtag #SaintDeath. And don't forget to tag US, @HachetteKids and tag Marcus too @marcussedgwick! !